I had to share a picture of this beer bottle. 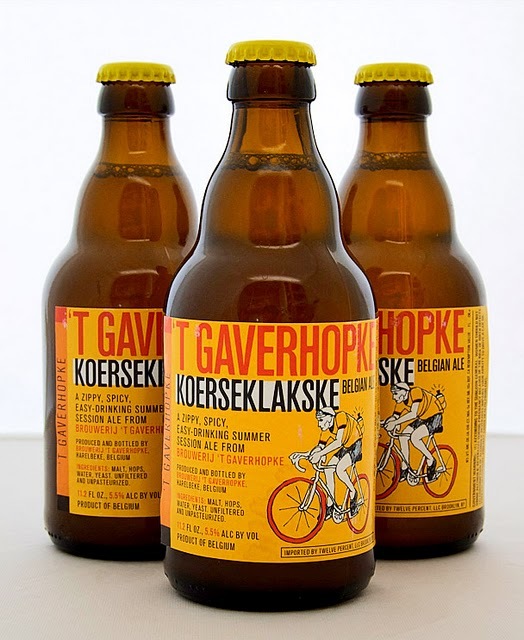 Brewed by the small Belgian brewery, 't Goverhopke, it's the perfect summer beer. In fact, the label says it all: zippy, spicy, and easy drinking! Drinking a few of these on a muggy 100 degree night is the city equivalent to taking a dip in a cold, refreshing pool. Along with the taste, I'm equally enthralled by the label. It's designed by Max Kaplun to commemorate Belgian cyclist Briek Schott. I'm not sure how many bars and restaurants carry this limited drink, but I had mine at Park Slope's Beer Table, a cozy spot frequented by both the beer's distributor and Max Kaplun himself! What makes a product so alluring that you'd leave your grocery store line to investigate it?